Capitalize military costs to defend foreign oil into the price of gasoline. Capitalize costs to cleanup our pollution into the price of gasoline. Capitalize costs of resource depletion into the price of gasoline. Backup data. This needs to be updated. When in the course of human events, it becomes necessary for Children to defend their liberty, to act as the Laws of Nature and of Nature's God entitle them, a decent respect to the opinions of all Americans requires that they should declare the causes which impel them. Civilization Killers Federal officials socialize the cost of oil-wars, resource depletion, pollution, printed money depriving Posterity of Life, Liberty, and energy to Pursue Happiness. The Preamble of the Constitution is the mission statement of the Federal government. Free speech being essential to the defense of Liberty, the Constitution strictly limits Federal involvement in infrastructure to build “postal roads,” the technology of free speech at that time. Usufruct, to use for profit without harm, is required to maintain principles of the Constitution. Federal officials violated usufruct in Ponzi schemes. Instead of capitalizing all costs into the price of use, Federal officials socialize costs into pollution, depleted resources, debt, and inflation that transfers wealth from the young to the old, “which would be reverse of our principle." "Then no man can by _natural right_ oblige the lands he occupied, or the persons who succeed him in that occupation, to the payment of debts contracted by him. For if he could, he might during his own life, eat up the usufruct of the lands for several generations to come, and then the lands would belong to the dead, and not to the living, which would be reverse of our principle." "...nor the nation itself can validly contract more debt, than they may pay within their own age, or within the term of 19 years?" Peak Oil. The Federal-Aid Highway Act of 1956 made oil the lifeblood of America’s economy undermining self-reliance. US domestic oil production peak in 1970. Since Peak Oil, national debt increased from $3.4 to $16 trillion. Resource depletion, pollution, oil imports and national debt increased in unison to the point Americans face Oil Famine, lives 50% dependent on foreign oil purchased with printed money and debt. Climate Change. We do not completely understand how climate works. 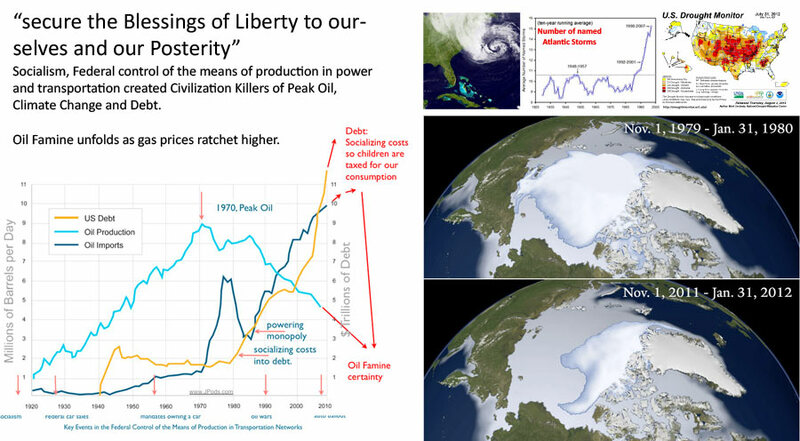 Federal subsidies to power and transportation infrastructures socialize pollution costs in to risks against the “Blessings of Liberty to … our Posterity.” Expect the drought of 2012 to cause food prices to jump in 2013. Life requires energy. Less affordable energy, less life. Debt. Debt is the tax on future labor, the labor of children that cannot vote against such tyranny. The current $16 trillion in debt and $122 trillion in underfunded liabilities is Taxation without Representation. Children did not consent for the Federal government to confiscate $52,313 (as of January 30, 2013) of the value of their future labor. Deprived of the value of their labor, people can afford less energy. Inflation. The government is printing $trillions to support excessive spending. As more dollars are printed for the government to spend, dollars buy less energy. Gasoline prices increased from $1.03 in 1998 to $3.70 today. Life requires energy. Less affordable energy, less life. Special Interests replaced States in defining national choices with the 17th Amendment in 1913. Mobilizing to fight World War I in 1918, the Federal government monopolized/socialized communications, power and transportation infrastructures as “natural monopolies.” Federal officials could now make the laws and give contracts to their friends to harness the American people to the infrastructures they selected. In 1935 the Rural Electrification Administration bankrupted the companies of the distributed power industry and wiped out 600,000 windmills to benefit large power corporations. The Federal-Aid Highway Act of 1956 funded the Interstates to benefit car and oil corporations. This requires $600 billion a year to import oil and $600 billion per year to defense access to foreign oil. 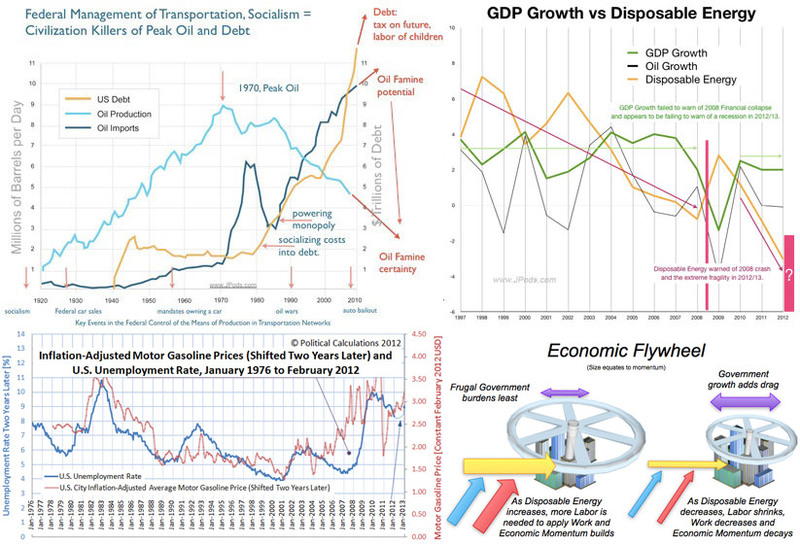 Federal policy socializes the cost and blood of oil-wars instead of capitalizing those costs into the price of gasoline. Federal policy socialized resource depletion, pollution, and storm costs (Climate Change) into risk to Posterity. Every child in America owes the Federal government $52,313 of their future labor to pay of the consumption of their parents, grandparents and great grandparents. In contrast to socialism in power and transportation, in 1982 communications infrastructure was restored to free markets. When liberty choose networks was restored to the people, long dormant innovations such as the Internet (1969) and radio telephones (1946) were able to commercialize. Millions of jobs, vast innovation and better service at lower costs resulted. Federalist #45 (James Madison): "The powers delegated by the proposed Constitution to the federal government are few and defined. Those which are to remain in the State governments are numerous and indefinite. The former will be exercised principally on external objects, as war, peace, negotiation, and foreign commerce; with which last the power of taxation will, for the most part, be connected. The powers reserved to the several States will extend to all the objects which, in the ordinary course of affairs, concern the lives, liberties, and properties of the people, and the internal order, improvement, and prosperity of the State." That Congress do not lay direct Taxes but when the Monies arising from the Impost and Excise shall be insufficient for the Public Exigencies. nor then until Congress shall first have made a Requisition upon the States to assess levy and pay their respective proportions of such Requisition, agreeably to the Census fixed in the said Constitution, in such way and manner as the Legislatures of the respective States shall judge best; and in such Case, if any State shall neglect or refuse to pay its proportion pursuant to such Requisition, then Congress may assess and levy such States proportion, together with Interest at the rate of six per Centum per Annum, from the time of Payment prescribed in such Requisition. Usurpation of Individual Liberty: Federal politicians and the massive bureaucracies diminish the presumption of individual liberty required by the enumerated powers of the Constitution. Providing subsistence they establish their power over the will of a majority. Federalist #79 (James Madison): "In the general course of human nature, A POWER OVER A MAN's SUBSISTENCE AMOUNTS TO A POWER OVER HIS WILL." Amendment 9 to the Bill of Rights affirms the Constitution's presumption of liberty. "The enumeration in the Constitution, of certain rights, shall not be construed to deny or disparage others retained by the people." An example of "kindness" being perverted to control, Federal Food Stamps have diminished home gardens that can mitigate famine risks so 47.7 million American depend on Federal food stamps and obesity is epidemic. Confiscating the value of labor by excessive taxes. American workers are coerced to work 2 hours and 34 minutes per day to pay taxes. Confiscating the value of labor by inflation. Liberty depends on the People owning the value of their labor. Printing money gives the government assets to buy commodities and enforce its will. Commodities increase in price as more and more dollars are printed. Gasoline prices have increased from $1.03 in 1998 to $4 in 2013. The value of labor is diminished. Taxation without Representation the future labor of children via debt. Socializing costs of resource depletion and pollution against the liberty of Posterity. If we need oil, so will our Posterity. Defending the liberty of Posterity mandates that all costs of use and restoration for like use by Posterity be capitalized into current costs. Usufruct, to use for profit without harm. Federal policies have so undermined self-reliance that Americans now face Oil Famine, consequences of a 50% dependence on imported oil for the energy to power daily survival. Americans face this crisis with governments confiscating nearly half their labor. Hide this content. Tyranny of the Majority: The Constitution structured The United States of America to be government by a majority that respects and honors the rights of minorities. Adults, the majority, have voted ourselves $16.4 trillion in benefits beyond our contributions to be paid for by the liberty and future labor of children, a minority that cannot vote against such tyranny. Federalist #51 (James Madison): "It is of great importance in a republic not only to guard the society against the oppression of its rulers but to guard one part of the society against the injustice of the other part. If a majority be united by a common interest, the rights of the minority will be insecure." Federalist #10 (Madison): “Hence it is that democracies have ever been spectacles of turbulence and contention; have ever been found incompatible with personal security or the rights of property; and in general have been as short in their lives as they have been violent in their deaths... A republic, by which I mean a government in which a scheme of representation takes place, opens a different prospect and promises the cure for which we are seeking." Article IV, Section 4: "The United States shall guarantee to every State in this Union a Republican Form of Government, and shall protect each of them against Invasion; and on Application of the Legislature, or of the Executive (when the Legislature cannot be convened), against domestic Violence." Key aspects of "Republican Form of Government" are no Taxation without Representation, and no Tyranny of the Majority. Federalist #63 (James Madison): "so there are particular moments in public affairs when the people, stimulated by some irregular passion, or some illicit advantage, or misled by the artful misrepresentations of interested men, may call for measures which they themselves will afterwards be the most ready to lament and condemn." Children are defenseless against their parents voting for benefits, socializing costs of resource depletion, oil-wars and pollution against the liberty of Posterity. Federalist #57 (James Madison): "...the House of Representatives, restraining them from oppressive measures, that they can make no law which will not have its full operation on themselves and their friends, as well as on the great mass of the society. This has always been deemed one of the strongest bonds by which human policy can connect the rulers and the people together. It creates between them that communion of interests and sympathy of sentiments, of which few governments have furnished examples; but without which every government degenerates into tyranny." Deficit spending is tyranny. Today's Taxation without Representation far exceeds the tyranny that proceeded the Revolutionary War. Massive domestic violence seems like as taxes to service and pay debts deprive families of the energy to homes, food and create jobs. Missing $4,155? It Went Into Your Gas Tank This Year. Usurpation of State Sovereignty: Federal officials unleashed Tyranny of the Majority and Taxation without Representation by violating State and individual sovereignty over welfare. Diversity of State economies was to be the defense against Tyranny of the Majority. underscore the importance of diversity in State economies a the cure for "faction," defending the rights of minorities against the Tyranny of the Majority. Their foresight proved accurate as adding of States finally broke the back of slavery. Federalist #51 (James Madison): “Ambition must be made to counteract ambition.” Sovereignty was to be divided, Federal in charge of defense, States taking care of welfare. Thomas Jefferson, Letter to Joseph C. Cabell, February 2, 1816 "The way to have good and safe government, is not to trust it all to one, but to divide it among the many, distributing to every one exactly the functions he is competent to. Let the national government be entrusted with the defense of the nation, and its foreign and federal relations; the State governments with the civil rights, law, police, and administration of what concerns the State generally; the counties with the local concerns of the counties, and each ward direct the interests within itself. It is by dividing and subdividing these republics from the great national one down through all its subordinations, until it ends in the administration of every man’s farm by himself; by placing under every one what his own eye may superintend, that all will be done for the best. What has destroyed liberty and the rights of man in every government which has ever existed under the sun? The generalizing and concentrating all cares and powers into one body." The Constitution was originally defined so direct election by the people of the House of Representative would represent the passions of the people. It was recognized that in choosing between choices the aggregate wisdom of all of us is wiser than the wisest of us. To check the avarice of the majority, the Senate was to set the national choices by defining national choices the House would choose between based on the experience gained in governing ourselves in the diverse States. Elected by State legislatures, the Senate was to provide a means for minority opinions to be represented at the Federal level. The 17th Amendment allowed Tyranny of the Majority. Without a check on the avarice of the many, car drivers sold their children’s liberty for cheaper gasoline. Legalized Fraud: Federal officials gave "too big to fail corporations" $700 billion in 2008-2009 which protected them from bankruptcy. Documentation of fraud that would have been exposed in bankruptcy proceedings was hidden; the fraud legalized. Imposed Titles of Nobility: Since 1920 Federal officials granted themselves retirement programs to be paid for by future labor of children that did not consent to being taxed for those benefits. A Title of Nobility is the granting of assets and/or income to be paid without the consent of the governed. Article I, Section 9 "No Title of Nobility shall be granted by the United States. Federal Police State Threat to the Liberty: Department of Homeland Security (DHS) has armed itself with 200 million rounds of ammunition, Homeland Security Act, Patriot Act, and National Defense Authorization Act to create domestic standing army with the ethics of TSA. The Constitution does not enumerate Federal policing powers. American soldiers have been trading blood for oil since 1990 without the Federal officials doing anything substantive to reduce the need for foreign oil. The self-interest of Federal officials is indicated in that there are 5 more flag officers (generals, admirals) today than were required to win World War II. In WWII there were 1.8 generals per 10,000 troops; today there are 7 generals per 10,000 troops. This bloat at the top of the military creates violations of the Principles of War and accounts for getting into and failing to decisively win wars in Vietnam, Iraq and Afghanistan. Approximately$711 billion on defense in 2008 while the rest of the world combined spent $759 billion. Treason by Federal Officials Eight Presidents have declared imported oil a threat to national security, an enemy of the Constitution, and the cause of oil-wars since 1990. In that same period, Federal officials taxed and built infrastructure that mandated oil imports increase from 20% to 50% of needs, aiding an enemy. Treason in Article III, Section 3; "Treason against the United States, shall consist only in levying War against them, or in adhering to their Enemies, giving them Aid and Comfort." Action Plan: Liberty is thorny, essential and depends on self-reliance. Self-reliance begins with the self, not Federal dependence. Everyone has a duty to "secure the Blessings of Liberty to ourselves and our Posterity¦." Federal officials mean well. But they also mean for us to use oil so we can work nearly half of each day to pay for their paychecks. In contrast, Liberty is not soft nor kind, just essential. Liberty requires we be self-reliant. Embrace self-reliance and the hardships required to voluntarily liquidate $16 trillion in debts, end oil addiction, end the oil-wars, balance the budget and nature. Cling to the collapsing oil-powered economy and be overwhelmed by climate change, defaults, crop failures and oil supply shocks over the next 10 years. Plant a garden. Self-reliance starts with the self. Victory Gardens can prevent oil supply shocks from becoming famine. Immediately arm ourselves. A well armed population is the best defense against the distributed enemy of terrorism and lawlessness that seems likely as Oil Famine unfolds. Between July 2013 and July 2017 incrementally capitalize all costs of using oil into the price of gasoline, and socialism and socializing oil costs into national debt. All costs of defense of foreign oil should be capitalized into gasoline prices. Dec 2013, terminate the Department of Homeland Security. Transfer essential external tasks to DOD and policing responsibilities to the States. Dec 2013, create and implement a plan for universal military service of about 5 months duration with the standard 6 years reserve duty and mandate that conscripts can only be used in foreign wars if those war are declared as defined by the Constitution. Dec 2013, reduction in the number of general officers in the military to no more than 2 per 10,000 Active Duty, Reserve and Guard troops (not counting conscripts in training). Give Division Commanders Unity of Command over all aspects of their mission, including use of energy. This will help break up the politically powerful and wasteful military-industrial complex. Dec 2013, cut US military oil use by 50% (to within US domestic oil capabilities). There is no security for America when her military depends on foreign oil and debt. Dec 2013, obtain State commitments to assert their Sovereignty to "provide" welfare and police powers. Dec 2013, obtain commitments from Congressmen and Senators to limit legislation to only "promote" not "provide" welfare. Dec 2014, transfer the taxing and "providing" of welfare to the States. Dec 2015, complete the transition from Federal control to "regulate" commerce only as it applies to limiting the risks of foreign wars. Section 1. Congress's direct taxation the shall be limited to providing for the common defense, funding Federal operations associated with defending liberty. Funds for Federal government promoting the general welfare shall be contributed by the several States. Section 2. Except in times of declared war, the budget must be balanced with sufficient reserves for periodically occurring disasters. Congressmen and Senators shall be ineligible for re-election if there is a Federal budget deficit for any two years of their term of service except during declared war. Section 3. Federal government regulation of commerce requires a 2/3rds vote by both houses of Congress. Section 4. To defend the Liberty of Posterity, except in times of declared war, the Federal government shall enforce usufruct, the capitalization of all costs so those benefiting from use, pay for that use, so resources are restored to like condition for use by Posterity. Section 5. Senators shall serve no more than fourteen consecutive years. Congressmen shall serve no more than eight consecutive years. Officer holder must wait three years between spans of Federal office. Section 6. To restore States as laboratories of democracy, reduce tyranny of the majority, and reduce the power of special interests Amendment XVII (17th Amendment) is repealed. Section 7. Robots are arms and may not be used by the Federal government against anyone in the United States without a 2/3rds vote by both houses of Congress. All laws governing the use of robots are to be clear, short and easily understood by the vast majority of Americans. To defend against robot attacks, all citizens practical will be receive 5 months of military training, be required to serve no more than 6 years in the militias of the States and may not be used by the Federal government except in times of declared war. Section 8. The Federal government is prohibited from engaging in foreign wars without a formal declaration of war for periods longer than 18 months, and forces greater than 400 people and costs greater 5% of defense spending. Section 9. The Federal government must not socialize costs that risk the liberty of Posterity. A 1/4th minority of the Senate will set the maximum pollution, resource depletion and other risks to Posterity every 6 months. Section 10. The Federal government must back paper money with commodities. A 1/4th minority of the House of Representatives will set the maximum value of currency to commodities every 6 months. Section 11. Frugal governments are essential to liberty and the value of people’s labor powers their pursuit of happiness. Except in times of declared war, the average American should work no more that 30 minutes a day to fund the Federal government.